Peg Staynor has been an outsider all her life because of a local superstition. The townspeople of Walvern believe her to be a river child, a person that brings bad luck to any who associate with her. When her mother dies suddenly the day World War I is declared, that belief is cemented in their minds. As Peg grows up she suffers ostracism while still loving her farm and her home near the Magurvey River. Even though people gossip about her, she finds she has allies in her sister Sarah, Doc Barrow and the friendship of an aspiring aviator. The war becomes a grim reality as local boys ship out and come back broken.Their families and friends are affected as well, including Peg herself who has to deal with her reckless sister. Will the war finally force Walvern to grow out of it's superstitious ways? 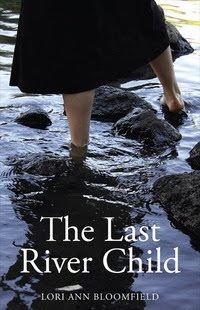 When I was offered The Last River Child by Lori Ann Bloomfield for review, I was of two minds. Both the premise and the historical setting of early 20th century Canada appealed to me. However, I hadn't heard anything about the book or this author. I decided to take a chance and accepted it because sometimes knowing nothing is a good thing. It could be a great surprise. At first, I was nervous that this would turn out to be the Great Depressing Canadian Book where there is misery at ever corner, because things weren't looking so bright. I'm glad I kept reading past the first few chapters because I ended up devouring The Last River Child in just one day.Though Peg struggles with various hardships, I didn't find the novel sunk in despair. I loved the characterizations; not just of Peg either, all the main characters have a complexity to them. I even came to sympathize with Seth, Peg's father, who sides with the townspeople more often than his own family.One of the most interesting characters, while not always likable, is Sarah. She smolders with suppressed anger and passion. I appreciated The Great War as seen through the lens of small town Canada. At first, it seems like an adventure but as the years drag on and the men come home changed, the town changes as well. They are no longer insulated from the world outside. Nothing can be the same. The town of Walvern is as much a character in the story as Peg is. Since I read this in a day, it's obvious that the pacing was quick and the story never lagged. I wanted to know what would happen to Peg. The ending was a bit too tidy but still made me happy. While it isn't perfect (I had issues with the river child tale), it was enjoyable and a great debut for Lori Ann Bloomfield. Thanks to Lori Ann Bloomfield and Second Story Press for the review copy.